From our armchairs in Bogota we’ve been following the rise of new bars serving good coffee in Dublin. So as we were there over New Year we decided to do one better. Over two days we slurped our way across the city as part of a coffee marathon. Conclusions? Read on. 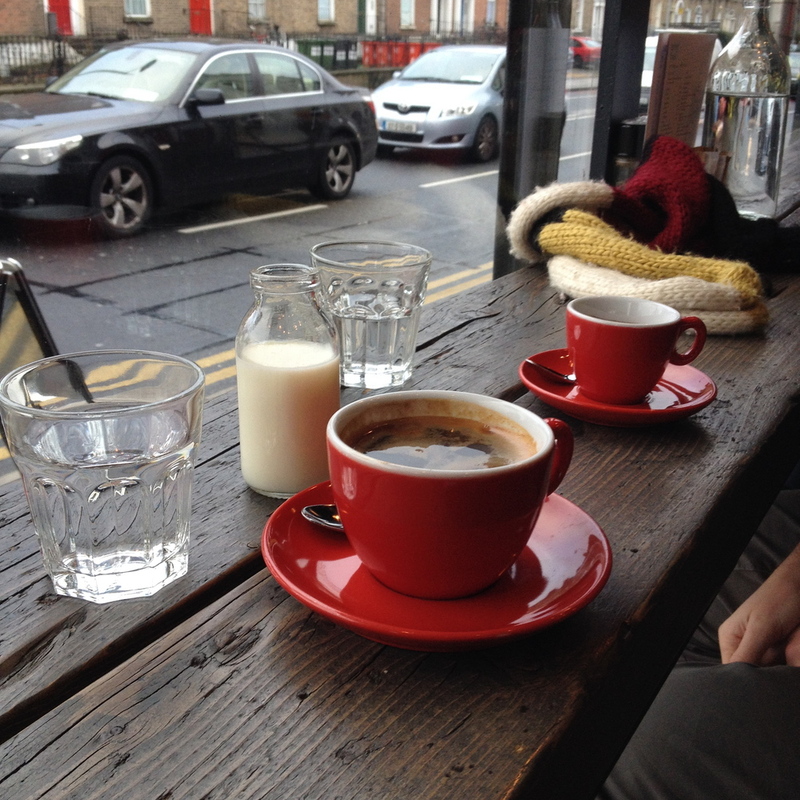 Starting in the Rathmines neighbourhood we visited TwoFiftySquare where they roast their own coffee. Exposed brick, large blackboard announcing the day’s coffee, welcoming atmosphere. In short, a great place. One cappuccino and a V60 filtered brew later and we were feeling perky. Time to hit the pavement again. But only 100 meters of it. Just up the road before the Grand Canal we stop at the Grove Road Cafe for an espresso and an americano of Red Bourbon, a variety of Arabica. Served in funky red cups no less, with a corner view of the world. Another winner. We then continue over Portobello bridge. Our next stop, ‘To Get Her’, was unfortunately closed (love the name though!). From there we walk to the city centre looking for the Science Gallery which hosts the Cloud Picker Coffee bar. Eventually we find it and are rewarded with excellent Costa Rican. It was then the turn of the nearby 3FE café and roaster for another Costa Rican filtered coffee and cappuccino. They also have bags of great coffee to take away! At this point we’re starting to feel that Costa Rican might be the predominant coffee in Dublin bars at the moment? No bad thing. Caffeine levels are running very high and we brave the 15 minute walk to Temple Bar hoping to visit Roasted Brown. But we’re too late and it’s closed. ¡Que pena! Volveremos. With so many great coffees behind us, the next day we decide to take it easy. After a quick cultural pit stop to the National Gallery we stop in at Bewleys, perhaps THE Dublin classic, and end the afternoon at the Twisted Pepper, on the other side of the Liffey with an excellent cappuccino from Vice. 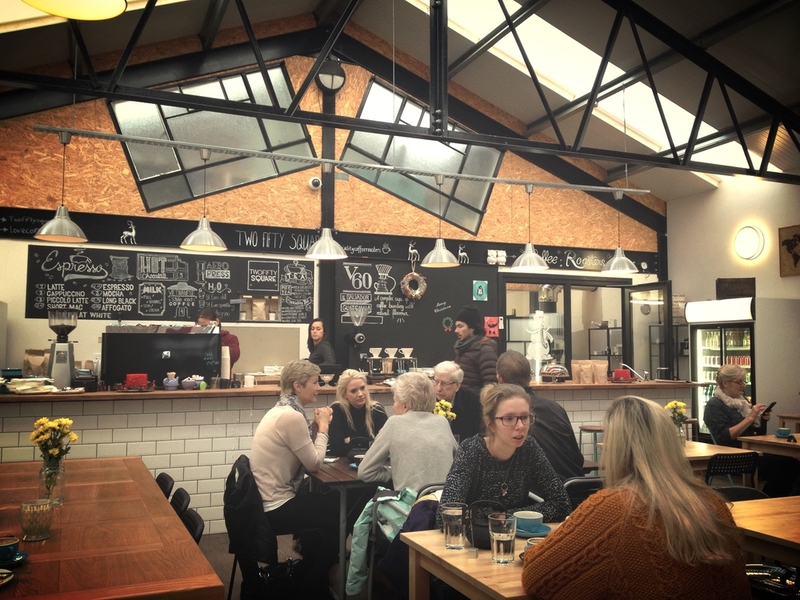 It was great to see that the coffee scene in Ireland’s capital is clearly booming and we still have many more cafes to visit on our next trip. We’re left with just one question however … where is the Colombian?